Eating steak it seems incomplete without any condiment. 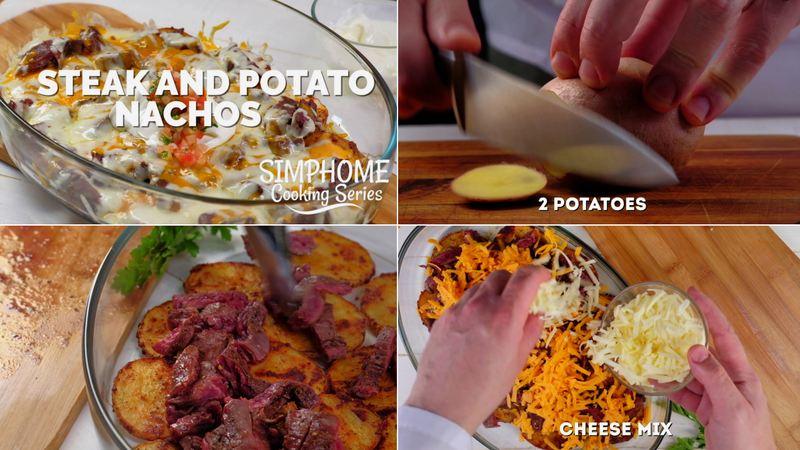 How about cooking steak and potato nachos? It is a great combination, right? Just take the list of the ingredients below and go to the closest grocery right away. Then, follow the instruction to cook the ingredients to taste delicious steak and potato nachos at home. When you are ready with the ingredients above, let’s get cooking. The way to cook steak and potato nachos are easy. Follow the steps below and you can enjoy the most delicious and fresh steak with potato nachos at home. Prepare a medium-size bowl and slice the potatoes rounded. Put the sliced potatoes into the bowl. You don’t need to remove the skin of the potatoes before using it. Mix the potatoes with olive oil, paprika, pepper, and salt. Mix the ingredients carefully and make sure that all the potatoes are covered by the ingredients. Prepare a baking plate which has been covered with a baking paper. Now, put the potatoes on the baking plate one by one. Bake the potatoes for 20 minutes at 450 Fahrenheit or 230 Celsius degrees. While waiting for the potatoes, let’s move to the skin steak. Sprinkle a pinch of pepper and salt. Let the skin steak for 10 minutes. After 10 minutes, grill the skirt steak in a pan for a few minutes for both sides. Then, chop the steak into small pieces. Take the potatoes from the oven and serve it in a bowl. Add the chopped skirt steak at the top of the potatoes. After that, add cheese mix which has been grated at the top of the skirt steak. When it is ready, broil the steak for 5 to 10 minutes. Steak and potato nachos are ready to serve! You can add mayonnaise as the garnish. Mayonnaise also gives rich flavor on the steak and potato nachos. Besides adding mayonnaise, you can also add a tablespoon of salsa sauce. It tastes fresh in your mouth. The last touch is to sprinkle a pinch of garlic. A complete steak and potato nachos are ready to serve. Steak and potato nachos is a perfect menu for the entire family, gathering party, or family reunion. The flavor is fresh along with the combination of sour and a little bit spicy. This combination which makes steak and potato nachos special. Just enjoy the food right away after you serving it to keep all the flavor of the ingredients. You can choose to grill the steak rare, medium rare, or well done. It’s up to you. Despite the level of the steak, it doesn’t change the flavor of the food. The most important thing, the ingredients are easy to find and you can also serve it in a few minutes.